Astronomers trace galactic crash, bang, wallop! The rate at which galaxies merge to mammoth sizes has been figured out by a team of astronomers led by Jennifer Lotz of the Space Telescope Institute in Baltimore, Maryland, revealing that any given Milky Way-sized galaxy has merged with another of comparable size over the past eight billion years as well as two to three dwarf galaxies over the same time period. A galaxy merger time sequence mosaic which shows the sequence of events as two spiral galaxies similar to the Milky Way merge. Image: Patrik Jonsson/Greg Novak/Joel Primack/Nina McCurdy. The merger rate is of a huge importance to understanding galaxy evolution, helping astronomers to understand how these giant structures have fattened up from devouring their galactic encounters. For some time, the rate at which galaxies coalesced in the past has had a question mark over it, but Lotz and her team hope that their study could help solve a combination of mysteries. “Having an accurate value for the merger rate is critical because galactic collisions may be a key process that drives galaxy assembly, rapid star formation at early times, and the accretion of gas onto central supermassive black holes at the centres of galaxies,” says Lotz, whose team’s results have been accepted for publication in The Astrophysical Journal. “When we applied what we learned from the simulations to the Hubble surveys in our study, we derived much more consistent results,” says Lotz who also compared her simulation to images of mergers identified by the DEEP2 survey with the W M Keck Observatory in Hawaii. 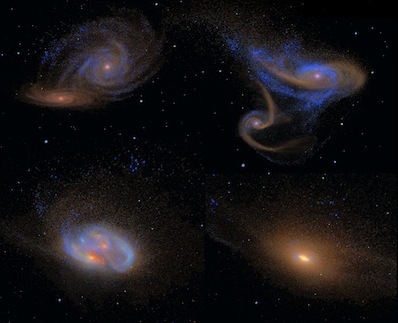 For a video highlighting four merging galaxy candidates in the study region, click: here.